- God certainly created this one at leisure! - A most beautiful and striking climber. 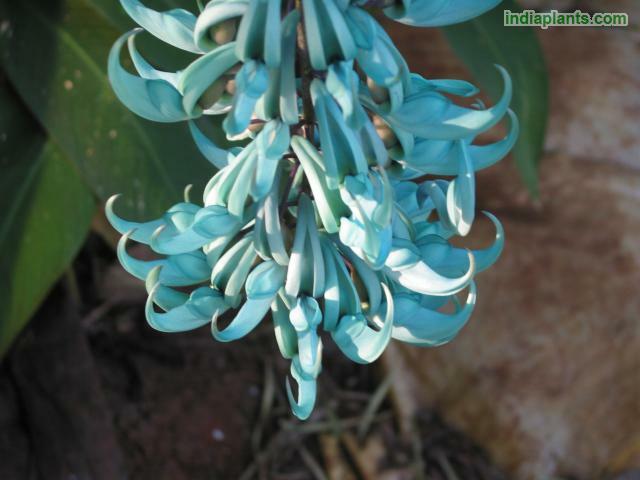 - The beak shaped flowers are a surreal shade of jade blue green. The color is almost floroscent. - The leaves are large, fresh green and shining. - The inflorosence is 50-80 cm long. - It is a stunning display of the curiously shaped beak like flowers. - It is a medium to heavy growing climber. - Plants have to handled carefully. They do not like their roots to be disturbed. Take care that the root ball stays intact while planting. - Plants are best trained over gazebos, pergolas, arches or frame support to allow to large racemes to hang down and show. - They grow well on fences too. But avoid planting on fences - as the flowers do not show off well. - Plants prefer well drained slightly acidic soils. - Avoid very hot and dry weather. Plants can partially shaded if required. - Prune back after the flowering is over. - Irrigate regularly during the hot dry months.